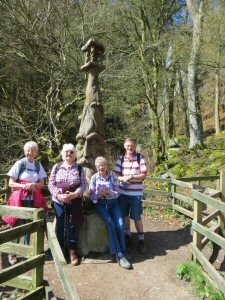 A walk , a talk, fresh air, physical exercise and fun is what what you can expect if you join the Newtown U3A Walking Group. We occasionally pass along ancient byways, and see history in its original setting. It provides the perfect way to do what U3A members do; sharing interests and information. We are fortunate to be able to do that in some of the most spectacular scenery around, learning from each other more about the countryside we pass through. As the programme and photographs show the walks are also a social event. Members having found a liking for pub lunches or afternoon tea means walk leaders are pressed to look for suitable venues en-route. Walks vary in length, from about 3 to 7 miles. If you like what you have read why not come and join us? New members are most welcome. Ruth who has run this group for many years has now decided to stand down. We all offer her our sincere thanks for all her efforts and now it will be a member led group. Will be on Friday 26th April, led by Nick and Sally. It will be up Earl's Hill starting at Pontesbury. Car sharing and picnic lunch planned. Details will be circulated shortly by Judi..
Mike and Paula, two of our walkers, have found interesting walks starting from Newtown.